Picante pimentón is a dried smoked paprika. 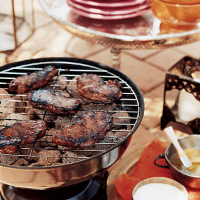 Here it gives succulent lamb a rich, smoky flavour with a hit of spice. Place the lamb in a non-metallic shallow dish. Combine the spices, lemon juice and oil in a bowl and spoon onto the lamb. Using your fingers, rub the mixture over the meat until evenly coated. Cover and place in the fridge for at least 1 hour but ideally for up to 24 hours. Preheat the grill to high or prepare the barbecue. Cook the lamb under the grill or on the barbecue for 4 minutes on each side for rare meat, 6 minutes each side for well done. Serve immediately, with Greek yogurt. Take the lamb to the party in its marinade, ready to cook. For a milder version of this spicy dish, replace some of the paprika with extra ground cumin. This recipe was first published in July 2005.